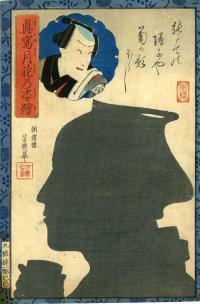 This type of print is known as a Shadow Print as what you are viewing is the Shadow of the person. Size: 9 1/8" x 13 3/4"
Misc: This is called a Shadow Print in that what you see is a Shadow. Size: 30 3/8 x 14 7/8"
Size: 29 5/8 x 14"